We’ll never know the behind the scenes politics involving Superior Spider-Man. To me, this feels like a Dan Slott storyline that Marvel blew way out of proportion. Using it to end Amazing Spider-Man and launch a whole new series seems way off from the story Slott is telling. Regardless, Superior Spider-Man is shaping up to a very cool slice of Spider-Man history. Issue #5 is the best so far. Slott has stepped the game up here, and I think he’s also introduced the start of whatever mental breakdown Doc Ock will have that might return Peter Parker to his rightful body. Massacre has escaped. This is not just a bad guy; this is one of the coldest, cruelest and most vile villain creations in a long time. Slott begins the story by having Massacre wipe out twenty plus diners at a fast food chain. Then, Massacre tracks down the billionaire owner and sells her on the idea of a murdering psychopath wearing a competing soda brand in order to make sure it gets bad press. Slott sets this up in the first two pages. Switching gears, Slott begins setting up the oddities of Doc Ock as Spider-Man. Having discovered Peter Parker never got his doctorate, Ock/Peter has returned to college, and is now forced to take tutoring lessons from a “little person,” something Ock scoffs at. Problem is, Ock begins to enjoy his tutoring and even the company of his new friend. Bigger fish need to be fried. and suddenly Massacre is back on the offensive. 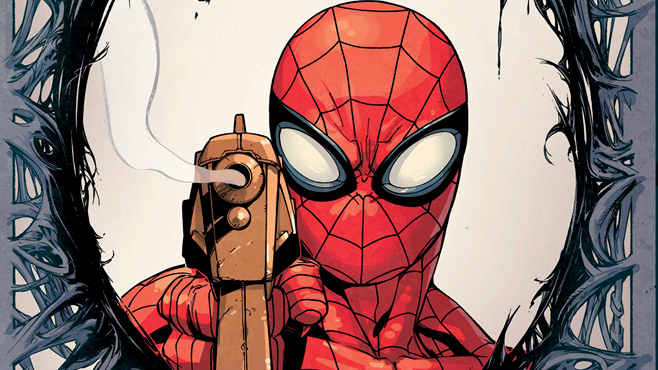 Through various plot devices, Spider-Man gets the upper hand and faces Massacre with his own gun. Massacre begins crying, since he’s afraid, and then joyous that he’s actually feeling an emotion. Spirit Peter Parker, who is traveling inside Doc Ock’s head unbeknownst to him, tries to convince his unknowing brain roomie that this display of emotion means Massacre can be saved. Ock-Spidey ignores the nagging in his brain that he can’t place and shoots Massacre. Does the world scorn him as a killer? No, in fact everyone including J. Jonah Jameson applauds Spider-Man’s harsh tactics with Massacre. This is where Slott shines. It would be so easy to just have Ock acting like a typical villain. Slott could write page after page of Doc Ock being a jerk and pluck the easy heartstrings of our love for Peter, but Slott is better than that. He allows Doc Ock room to become a more realized, and even truly superior, hero. For instance, Ock’s spider robots, the ones that allow him to patrol the entire city instead of just one area, Ock now has their eyes feeding into his costume. In short, Ock can see everything they can. He instantly sees most of the criminal element in the city. Spirit Peter Parker, as much as he hates it, has to admit that’s a great idea. Ock’s past as a villain allows him insider knowledge to how Massacre operates, giving him not only the upper hand in the confrontation, but also saving innocent lives. Spirit Peter is dumbfounded, and hesistant to admit Ock saved the day. The best of all these examples is Spidey shooting Massacre. Peter has lived on the idea that not killing makes him more of hero to the people. Seeing them applaud Ock shooting Massacre has to be unsettling. All of these things make Superior Spider-Man something you actually want to read instead of being something your'e just to going get back to when Peter is in the driver’s seat again mentally. I still agree with my review of the end of Amazing Spider-Man and the first issue of Superior, not because Slott screwed up, but because Marvel did. All of that aside, Dan Slott is proving once again why his take on the legacy of Spider-Man will be looked upon for years to come as some of the best ever written. Giuseppe Camuncoli’s art not serving the story well. He’s too reminiscent of Humberto Ramos, but not nearly as talented. I will say this; his actual Spider-Man pencils are excellent. He doesn’t step entirely away from the original costume, but just enough to remind us this is Doc Ock, not Spider-Man. Outside of that, his art does nothing to pop. Especially the faces, which always seem to look aggravated or like they have to go to the bathroom. Camuncoli either needs to step up his game or step aside for a better artist. Assisting Camuncoli with inks is John Dell. The two manage to ink everything nicely, but like the pencils, with little pop or shading to them. The way the inks lay over the pencils, each panel looks two-dimensional. There is no depth to them. Edgar Delgado and Antonio Fabella handle colors with the same drab, boring style. Four people handling the art and it fails across the board? That’s incredibly unfair to the power of the story Slott is writing. Superior Spider-Man can be held up as another reason why Dan Slott’s vision for Spider-Man has given fresh perspective to an age-old hero.